Are you happy with a one size fit’s all approach to diet, lifestyle, exercise and supplementation? Would you prefer to be recognised for the biochemical individual that you are? At Inspired Health & Prosperity we understand that no one person is the same. Just as everyone’s fingerprints are different, so is your biochemical make-up. We will not only take into account your blood type, but also look at other genetic markers to determine the most efficient and effective anti-inflammatory support processes for your body. Our aim is to expose you to a new way of eating and living that has already transformed the health of millions across the globe, and support you in achieving your own unique and complete transformation. Would you like to join one of our information sessions? Check out the workshop links to register your place. 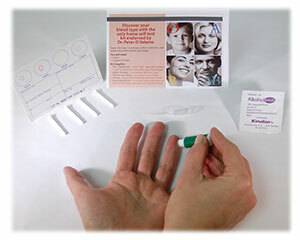 Home Test Blood Typing Kits are available. The results are instant and allow you to take the first important step in reducing inflammation and transforming your diet. 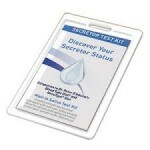 Secretor Test Home Kits are also available, and will allow you to personalise your diet even further and ensure that you are getting the right blood type diet for you! I highly recommend completing your Secretor Status as the general blood type diet only fits about 80% of the population. If you are a NON-Secretor, then the diet assigned to your blood type will differ greatly from the regular blood type diet for your type. This is a one time only test and will help us to determine the BEST diet options for YOU.